The Glossy Ibis is an extraordinary bird. It starts life as a juvenile with an appearance similar to that of the adult but with a dark banded bill and duller body. It then blooms into an adult with a long, down-curved bill, long dark legs, and a body that is all dark. It is characterized by its maroon and green color and glossy wings. Both male and female Ibises are similar in appearance. 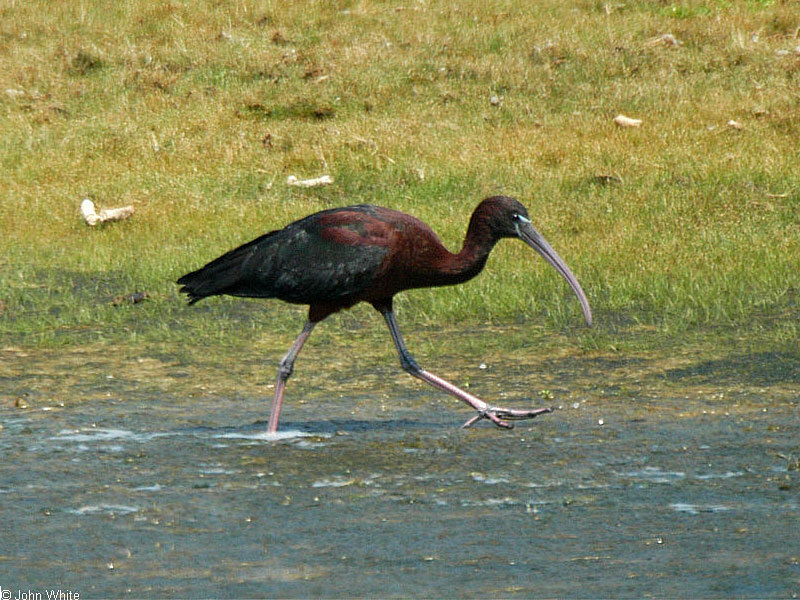 The average Glossy Ibis is about 1.2 lbs and 23 in. in length with a 36 inch wingspan. The Glossy Ibis is a transient, found in Northern Virginia during migration. It inhabits wooded wetlands near the coast. It is also found on flooded and dried fields, sewage ponds and estuaries. Glossy Ibis feed in contained flocks that are usually small in nimber. They are omnivores, which means they feed on both plants and other animals. They collect their prey by using their long curved beak to probe the water for water beetles, dragonflies, flies, worms, leeches, mussels, clams, frogs, small snakes, small fish, and various seeds. During breeding season both male and females build a tightly wound bowl shaped nest in study trees. The female lays 3-4 eggs which are a greenish-blue to dark blue color. The eggs need to be incubated for at least 3 weeks by either parent. When the chicks hatch they are nurtured by both parents. When they grow to be about 2 months old, the Ibises fly away and become independent. Over time, the population of the Ibises has grown significantly. Although, today factors such as pollutants, wetland draining and oil spills are greatly pressuring the existence of these magnificent birds.